"Simple, delicious, and the mustard sauce makes it a nice change." In a large, resealable plastic bag, mix flour, salt, and pepper. Place cubed chicken in the bag, and shake to coat. Melt butter in a medium skillet over medium heat, and saute the chicken until browned. Remove chicken from the skillet and set aside. Stir shallot into the skillet, and saute until tender. Mix in vermouth, chicken broth, Dijon mustard, and stone ground mustard. Return chicken to the skillet, and blend in the heavy cream. Cover, reduce heat, and simmer about 15 minutes, until the vermouth mixture has thickened. Mix in parsley, lemon juice, and lemon pulp just before serving. 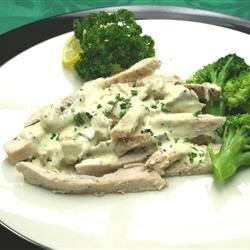 See how to make chicken breasts in a creamy dill and caper sauce. Not bad, but it didn't "wow" me either. I subbed 2% milk for the cream & marsala for the vermouth. I had to improvise with the mustards because I didn't have plain dijon. I used a maple dijon. Everyone love it. This recipe was absolutely top notch. I also use the mustard sauce with pork tenderloin. This was pretty good. I didn't have the dijon mustard so, considering it was still good, I can only imagine it would be even better with it.